In March, Jennifer Egan (A Visit From the Goon Squad) paid a visit to Google and was asked to sum up her year since winning the Pulitzer Prize in 2011. She said: "I am still not used to the idea that I won it. Maybe I will finally really grab hold of that idea when someone else wins it. I will say 'No, I want it!'" Little did she know that just a few weeks later the Pulitzer Prize judges would decline to name a successor, leaving her in mental limbo for yet another year. 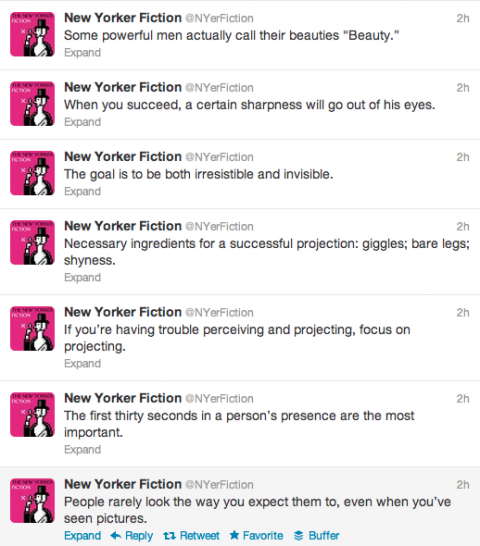 She seems to be handling it pretty well -- well enough to publish a new short story on The New Yorker's Fiction twitter stream. Yes, you read that right, its Twitter stream. If you're a Twitter user, you can catch the live stream between 8 and 9 P.M. EDT. (And you can also follow our lively Twitter stream here.) If micro-serialized fiction isn't your thing, then you can always follow the story on The New Yorker's "Page Turner" blog.